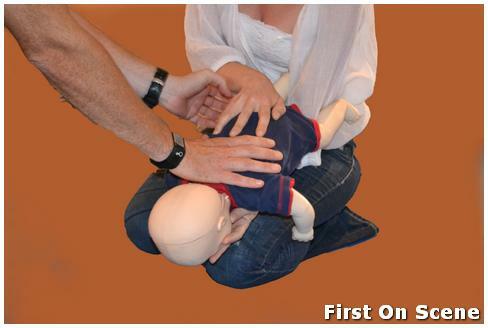 Is a full first aid course necessary or is a CPR course sufficient? What is the best thing to do if you suspect someone is having a heart attack? What is the difference between a heart attack and cardiac arrest? A heart attack occurs when the heart muscle begins to die usually due to a blockage in one of the coronary arteries supplying the heart. The patient will often complain of chest pain or discomfort that may move down the left arm or up into the jaw, however it is possible to experience a heart attack without any pain what so ever. This patient needs medical assistance ASAP to prevent going into cardiac arrest. Cardiac arrest occurs when effective heart functions stop and the pulse in the neck (Carotid Pulse) can no longer be felt. This patient will require immediate CPR and possibly a shock from an AED (Automated External Defibrillator) or the patient will die. The sooner effective CPR is started, the greater the chance of survival. What is an AED or Automated External Defibrillator? At the onset of cardiac arrest, the heart muscle ceases to beat and just begins to quiver. We call this ventricular fibrillation. The AED (Automated External Defibrillator) is a machine that will provide an electrical shock to the heart to stop the quivering. This will allow the heart muscle to reset itself. The heart will then begin to contract normally again and generate a pulse. The AED was designed for members of the public to be able to use. They can be found in Gyms, airports, shopping centres etc. and can be effectively used on adults, children and infants. It is a simple device to use and with a little training, can quiet literally be the difference between life and death. Where do accidents in the home most frequently happen? Most accidents around the home usually involve children. The most significant of these are choking (food and toys) and drowning (Swimming pools, ponds and baths). Treatment of both of these incidents can be easily learned by parents, care-givers and domestic workers and make a huge difference to what otherwise would be devastating to the families involved. What are the most common medical emergency accidents in the office? In a corporate environment, most incidents are medically related and are often linked with stress and long working hours. The most common of these are heart attacks, strokes, diabetic comas and epileptic seizures. When treating these patients, often it is as important to know what not to do as it is to know what to do. Generations of old wives tales have led to the uninformed often causing more harm to the patient even though the intention was good. What are the most common medical emergency accidents in a factory, building or industrial environment? Most of these accidents are traumatic in nature. Cuts and bleeding are obviously common place. If treated correctly most bleeding can be controlled without professional intervention. Falling from heights is also common. This often results in head, spinal and broken bone injuries. These injuries must be treated correctly. Incorrect treatment of a head or spinal injury could lead to paralysis or even death. What are the three most important things to do if you are the first to arrive at a car accident? What is the one thing you must not do if you are assisting a motorcyclist that has been knocked down? Avoid removing the helmet or moving the patient unnecessarily. If the patient is breathing effectively, leave the helmet on until emergency services arrive. Paramedics have been trained in safe helmet removal. If your patient is not breathing, the helmet must be removed. It is impossible to do effective CPR with the helmet in place. All of these techniques require training and explanation and should not be attempted unless you have been trained to do so.